Elsevier and The Elsevier Foundation have been long-term supporters of the Gender Summits, supporting individual events over the years. We are delighted to announce a new partnership between the Elsevier Foundation and Portia: Gender and Science (founders of the Gender Summits) that will help provide continuity across the regional editions of the Summits and strengthen our knowledge production work. The strategic partnership builds on the synergies between Elsevier and the Gender Summits. 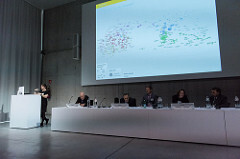 Photograph: Rachel Herbert of Elsevier speaking about 'Extracting STEM gender indicators from published sources' at the GS9Eu. A dedicated GS10AP website has been launched. The GS10AP will be held on 25 - 26 May 2017 in Tokyo. Go to the website to find out more about the themes, the satellite events planned, partners practical information and much more. The Call for Abstracts will be launched on 28 November. We will be bringing you more info on the event soon. The event will be held under the title: Better Science and Innovation through Gender, Diversity and Inclusive Engagement. 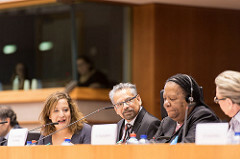 The Gender Summit 9 Europe was held on the 8-9 November 2016 in Brussels. Part of the GS9Eu was held in European Parliament Hemicycle, hosted by the FEMM Committee. The session included contributions from Iratxe Garćia Pérez, Chair, European Parliament Committee on Women's Rights and Gender Equality (FEMM), B. Mario Pinto, President, Natural Sciences and Engineering Research Council (NSERC), Canada, Minister Naledi Pandor, Minister of Science and Technology, South Africa and Prof Marja Makarow, Director, Biocentre Finland; Member, Gender in the Nordic Research and Innovation Area Programme Committee, NordForsk (photographed left-to-right). We are very grateful to the FEMM committee for hosting the session, and keeping gender firmly on the agenda during the development of the Horizon 2020 programme. The Gender Summit overarching theme, guiding its evolution, is Quality Research and Innovation through Equality. At the heart of our work through the Gender Summits is evidence => consensus => action => change. The GS9Eu was held under the sub-theme Gender-based research, innovation and development for sustainable economies and societal wellbeing. This was chosen because the GS9Eu coincides with important policy developments in Europe and globally that look towards science knowledge and technological innovation to create a better future for all. Significant here are: the new EU Gender Action Plan and Horizon 2020; the UN Sustainable Development Goals; the African Union’s Africa 2063 and Continental Education Strategy Africa agenda; and the OECD vision for Inclusive Innovation and Creating Our Common Future through Science and Technology. The GS9Eu was a tremendous success, attracting 250 participants from 40 countries to hear from over 65 speakers in 15 sessions. Read the #GS9Eu hashtag on Twitter for more on the event. The GS mission is not limited to Europe, it has been taken up across the globe: 2017 will see the GS Asia-Pacific held in Tokyo and the GS North America held in Montreal. Plans are underway for further events in Africa and Latin America. We work with selected consortia of key stakeholders in each region to convene the Gender Summits. You can now download the GS9Eu report to the European Parliament and European Commission, the presentations made, and the posters presented. Heads of 50 research councils from around the world met in New Delhi, India, May 25-27 for the fifth annual gathering of the Global Research Council, hosted by Research Councils UK (RCUK) and the Indian Science and Engineering Research Board (SERB). The aim was to share best practice and discuss research funding policy issues, and in particular equality and status of women in research. 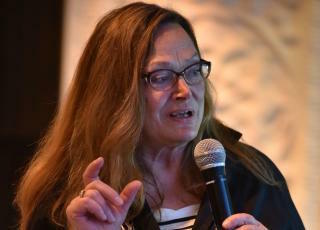 Dr Elizabeth Pollitzer, Gender Summit founder, has written an article for Elsevier Connect outlining the mission statement and commitments that emerged from the meeting. Dr Pollitzer gives an example from agriculture to demonstrate the opportunity to achieve important cross-cutting impacts for society and the environment by looking at the implementation of the SDGs in a gender-sensitive way. Improve the design and implementation of innovation strategies; Improve impact of public investment in science and innovation; Promote social responsibility of science policies in 21st century; Promote science and innovation for health; Create new technologies for a sustainable future and the green economy; Promote science and innovation for global inclusiveness. The new Gender Summit report, Gender in science and innovation as component of inclusive socioeconomic growth, shows through evidence and examples that gender issues should be part of these discussions. This latest GS report shows that gender issues should be part of these discussions and examines how OECD agenda for “Creating Our Common Future through Science and Technology” can benefit from considerations of the gender dimension. The report follows on from the “The Role of Gender-based Innovations for the UN Sustainable Development Goals: Toward 2030: Better Science and Technology for All” GS report published earlier this year, applying a similar analytics framework to the OECD agenda. The report is the latest in a series of analysis reports published the Gender Summit community. WISET holds Gender – Forum: The Role of Gender - based Innovations for the UN Sustainable Development Goals, What are our next Steps in Korea?